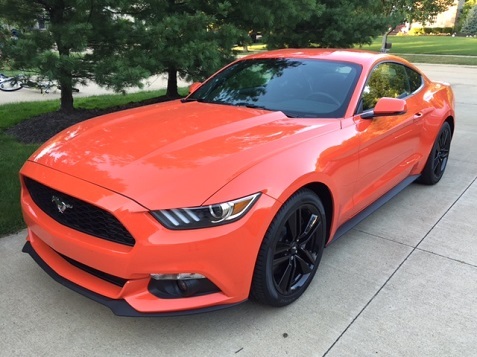 The iconic Ford Mustang was completely redesigned for its 50th anniversary following the wildly successful retro design introduced for the 2005 model year. Like many I was looking forward to the new design and driving the new model and overall came away impressed with the new model. Ford hasn’t been in the minivan business for a few years now, but the 2014 Ford Transit Connect XLT Wagon wants your attention if you’re looking for a people mover. Dubbed the #unminivan, there is a lot of value in a vehicle that looks good, drives great and can haul the family from A to B and back again! We drove the 2014 Ford Transit Connect XLT Wagon Review and found a sweet ride that doubles as a commercial gem. There is a very distinct look about the 2014 Ford Transit Connect XLT Wagon, and we discovered that folks either love or hate the exterior design. One has to remember that the Transit Connect was originally built for commercial use but has now styled up the skin to fit right in with the traditional SUV or minivan. The vehicle was introduced in Europe in 2002, and now, the 2014 Transit Connect van has been named International Van of the Year by a panel of European auto media. It debuted in North America in 2009, quickly becoming a fleet favorite for its size and capability as a hauler of people and cargo. Now, with the arrival of the all-new Transit Connect Wagon, retail buyers have a fresh alternative to the traditional people mover. The 17-inch alloy wheels looked smooth along with body color side moldings, body color door handles, fog lamps with body color bezel, halogen headlamps, integrated spotter mirrors, power heated exterior mirrors and privacy glass. The Transit Connect Wagon and Transit Connect van offer spacious interiors and customization options that allow owners to personalize the vehicle to their lifestyle. The short-wheelbase, five-passenger wagon model, as tested, allows for the second row to flip, fold or be removed entirely. It features 77.1 cubic feet of cargo volume behind the first row with the second-row seats flipped forward, and 46.9 cubic feet of volume behind the second row. The long-wheelbase, seven-passenger wagon model has second- and third-row seats that fold flat. It has 104.2 cubic feet of cargo volume behind the first row with the second and third row folded flat; with passengers in the second row, cargo volume reaches nearly 60 cubic feet. The wagon model’s interior roominess is especially notable for its headroom, which bests many other seven-seat vehicles. Available headroom in the first row is 46.8 inches, with 45.1 inches in the second row. The long-wheelbase model has 41.3 inches of headroom in the third row. 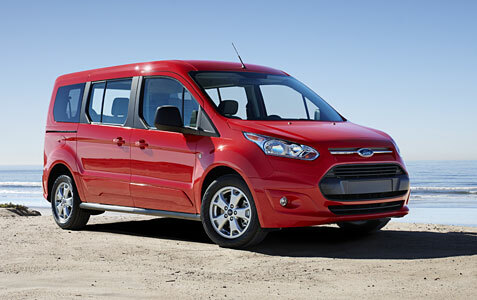 There are tons of ways the new Ford Transit can help business people save time. Small improvement like added cargo space and easy loading features can significantly help a business’s efficiency. When you start to add up small savings over time, you start getting to real money. So watch the video and think about how you can ave time, which then helps you make more money. As the Ford Focus continues posting very impressive worldwide sales figures, one need not wonder what the Blue Oval will do to continue building momentum behind this Focus nameplate. Ford has at last released the long-awaited Focus ST, which absolutely takes the compact car segment to new and wonderful heights. The all-new Focus ST is Ford’s first truly global performance car, building on the heritage of previous Focus ST models in Europe and giving drivers around the world the opportunity to share the exhilarating performance, excellent handling, addictive sound and sporty design that Ford’s ST badge represents. 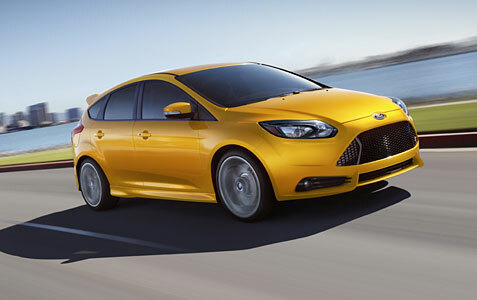 With innovative technologies throughout, the Focus ST will be highly fuel efficient too. Yes, the 2014 Ford Focus Hatchback ST was one of our favorite reviews in recent times for numerous reasons, and we’ll let you know why below. From the striking one-piece design interpretation of Ford’s signature trapezoidal grille at the front, through the sculpted side skirts and dynamic rear bumper with prominent diffuser-style vents in the lower fascia, Focus ST’s design adds aggression and aerodynamic stability. The highly effective roof spoiler is optimized to deliver improved high-speed stability and reduced drag, while the unique center-exit exhaust sports a tailpipe design influenced by the exclusive hexagonal mesh of the front bumper. 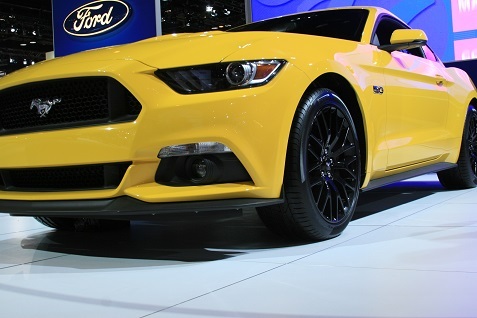 The well-recognized Focus ST style extends to the iconic Y-shaped alloy wheels. Wrapped around the rado grey 18-inch wheels are high-performance 235/40R-18 Goodyear Eagle F1 Asymmetric 2 tires, developed after rigorous testing on all kinds of road surfaces and in all kinds of conditions. These dynamic features together play a huge role in what Ford has accomplished her, as the 2014 Ford Focus Hatchback ST truly resembles a sports car rather than a compact. The Focus ST turned heads wherever we drove the car, and we realized quickly that the Focus ST was a superstar on the road! The performance blue paint was also a real winner that just highlighted all of the muscular curves and highpoints of the ST. When you first enter the cabin of the 2014 Ford Focus Hatchback ST, the first thing you notice are the black and blue partial leather recaro sports seats that look like they would fit nicely into a track-only racing car. These seats are not for the buyer looking for bland looks and passive seating, as these ST sports seats wrap around your body and keep you nice and snug for those tight corners. The dashboard is closing in on perfection with a well laid out instrument panel and a smart center console with armrest with storage and room for two good size cups. The leather-wrapped sport steering wheel with the ST branding was super cool and again an upgrade from just about anything you can find stock from the factory. An illuminated entry, MyFord touchscreen with Sirius, dual zone electric air temp control, navigation system and one of the top stereo systems in this price range is also included. We fit four adults somewhat comfortably in the Focus ST and felt there was ample storage in the hatch area.